Recently I did a blog post about how to use a commercially available game in therapy. While some games are easy to just open and throw into therapy, others require more adaptations to get it to “work” during therapy without distracting from the skills you are trying to target. Head over to my blog to check it out! 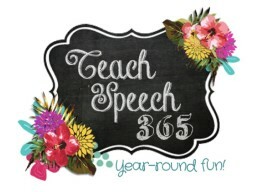 Feel free to email me at teachspeech365@gmail.com with any questions. Find me on Facebook, Pinterest, Instagram, or Teachers Pay Teachers!